Mensah analyzed employment and education data from black Canadians and found numbers that somewhat surprised me. 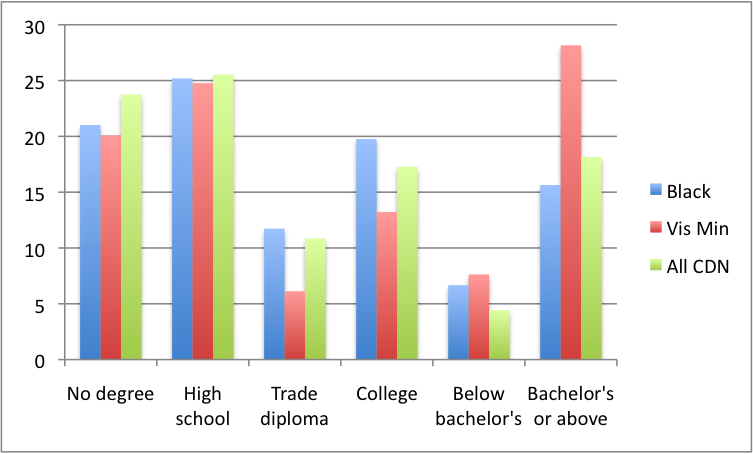 Black Canadians are, surprisingly, better educated than the average Canadian. The exception to this trend, which more or less matches my general expectation, is that there are fewer black Canadians with university degrees than the general population. Given what we know about the kinds of jobs that black Canadians were brought in to fill – mostly manual labour positions – it is unsurprising that there are few black graduates. What does surprise me, however, is that the number of people with no qualifications whatsoever is lower than the general population. This may be the product of the “points” system of immigration (people with no education cannot immigrate) and the recency with which most black Canadians arrived here. There also seems to be a push into skilled trades and college, which also supports this interpretation. 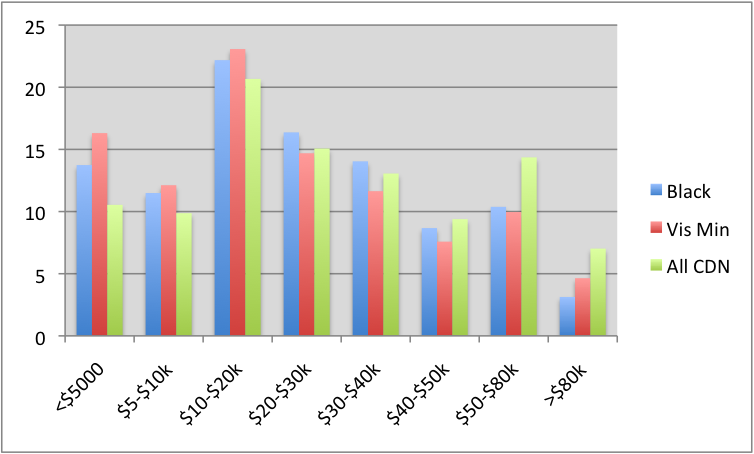 There are fewer black Canadians who are high-income earners when compared to the general population, but judging by this graph, one could make the argument that this is largely a phenomenon of recency of immigration. After all, if it takes several generations to build wealth and enter top income brackets, and most black Canadian immigrants have been here for only a single generation, we would expect to see this pattern. In other brackets (except the very lowest, for reasons that I imagine have a lot to do with the amount of social/familiar support available for black/minority Canadians compared to white Canadians), we see proportions of income that are relatively similar. It should be noted, however, that there is no province in which median income for black Canadians is greater than or equal to the general population (British Columbia and Manitoba are the closest, while Alberta, Nova Scotia, New Brunswick and Quebec all have median income gaps of about $6000). We can see that black Canadians are less likely (slightly more than half as likely) to be in management positions than the average Canadian, and also less likely to work in the sciences. Conversely, that gap seems to be made up largely by overrepresentation in business/finance/administration and health (this latter group being chiefly black women working in front-line health care). Other than that, there are not the dramatic differences in labour sector that one might expect if the Canadian experience perfectly mirrors the American one. So what can we conclude from this extremely crude examination of employment statistics? The simple take-home message from the numbers above seems to be that while there is an employment gap, it’s a moderate one. The differences seen in these statistics seem to suggest that due to some combination of education choice and recency of immigration, black Canadians do not make as much as the general population. The difference is not staggering, but it’s there. The problem inherent in these kinds of crude examinations is that they often mask phenomena happening well below the surface. Mensah highlights a regression analysis (remember those?) 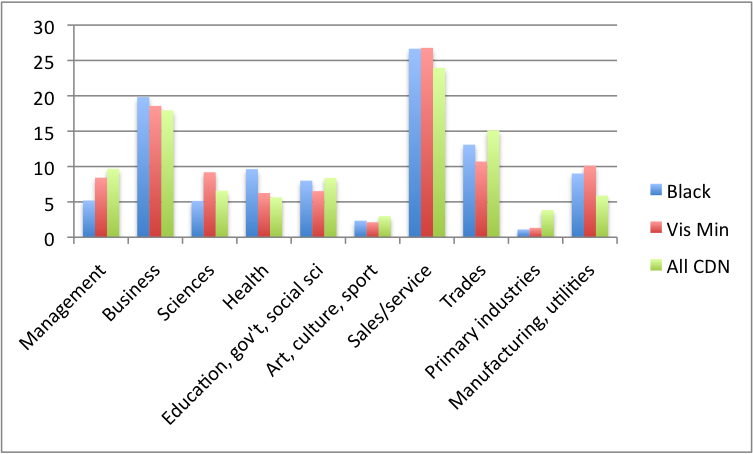 in which wages are causally examined according to education, gender, age, experience, location, proficiency in English or French, immigration status, and time since immigration. This analysis revealed that, when you control for all of these factors, black men (and not women***) face a 22% wage gap when compared to the general population. In other words, black men are paid 22% less than their non-black counterparts for identical work. The interpretation of this statistic, and the implications surrounding it, are worthy of an in-depth analysis, which I will conduct this afternoon. *The participation rate is the number of people who are either employed or seeking employment, divided by the total number eligible to work. **Again, and for similar reasons, this may have substantially changed in the past 6 years. ***Mensah devotes an entire section of this chapter to the issues that black women face in the Canadian labour market. Women are paid less than men in aggregate, and are highly concentrated as front-line health care workers, in administrative roles, and in sales (when compared to black men). Labour laws and union representation in these fields may explain why there is no wage gap for women.